Incheon airport in Seoul, South Korea has been voted the best in the world. Hong Kong international airport came second, with Singapore's Changi Airport third, in a survey by the British-based Skytrax consultancy group. The agency interviewed 8.6 million passengers at 190 airports about their experiences, from check-in, departures, transfers, through to arrivals. Six Asian airports made the top 10, along with Zurich, Munich, Amsterdam and Auckland. Skytrax said that the voting was very close between the top three airports, and at one point it thought there would be a dead-heat. Hong Kong won the award last year. Skytrax CEO, Edward Plaisted, said that Incheon had been "in the global top five ranking for the World Airport Awards during the past five to six years, and it is a great achievement for them to secure this premier mark of customer satisfaction." Incheon airport, about 60km (37 miles) from Seoul, opened in 2001 to replace Kimpo airport as the international gateway to South Korea. 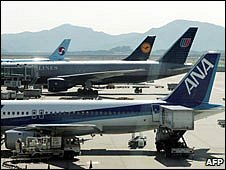 It is one of only three airports in South Korea making a profit. In 2006, it was the 11th busiest in the world for international passenger traffic. In the regions, Cape Town was named the best airport in Africa, Zurich in Europe, with Tel Aviv winning the award for the Middle East. Dallas/Fort Worth came top in North America, Lima in South America and Panama in Central America. Skytrax found that Dubai had the best duty free shopping; Hong Kong the best dining; Helsinki the best baggage delivery, and Kansai in Japan the "cleanest airport washrooms". Heathrow airport in London did not figure in the awards. However, it does merit "three stars" in the Skytrax consultancy rankings, along with airports such as Abu Dhabi, Bangkok and Johannesburg.